30-06 Springfield 165 grain Nosler AccuBond~ The .30-06 Springfield was introduced to in 1906. The “.30” refers to the caliber of the bullet. The “06” refers to the year the cartridge was adopted—1906. The .30-06 remained the U.S. Army’s primary rifle and machine gun cartridge for nearly 50 years before being replaced by the 7.62x51mm NATO (commercial .308 Winchester). The .30-06’s power and versatility have kept the round as one of the most popular for hunting big game. 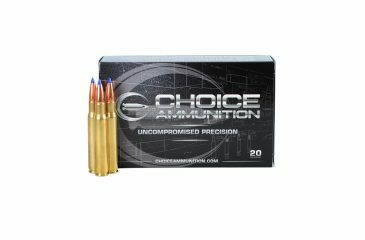 Choice Ammunition has taken our 100% hand-loading techniques and produce an extremely accurate, highly dependable round for the .30-06 in this load. Our loading tolerances are only matched by passionate hand-loaders in their own loading rooms. Consistent seating depths, powder charges and proprietary formulas of Choice Ammunition, make this 165 grain Nosler AccuBond round the best you can buy on the commercial market today. 30-06 Springfield 168 grain Barnes TTSX~ The .30-06 Springfield was introduced to in 1906. The “.30” refers to the caliber of the bullet. The “06” refers to the year the cartridge was adopted—1906. The .30-06 remained the U.S. Army’s primary rifle and machine gun cartridge for nearly 50 years before being replaced by the 7.62x51mm NATO (commercial .308 Winchester). The .30-06’s power and versatility have kept the round as one of the most popular for hunting big game. 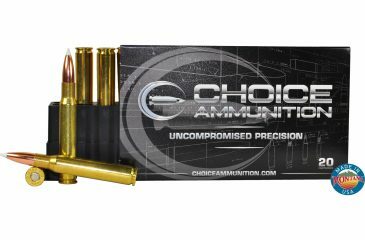 Choice Ammunition has taken our 100% hand-loading techniques and produce an extremely accurate, highly dependable round for the .30-06 in this load. Our loading tolerances are only matched by passionate hand-loaders in their own loading rooms. Consistent seating depths, powder charges and proprietary formulas of Choice Ammunition, make this 168 grain Barnes TTSX round the best you can buy on the commercial market today. .30-06 Springfield 180 Grain Barnes TTSX~ The .30-06 Springfield was introduced to in 1906. The “.30” refers to the caliber of the bullet. The “06” refers to the year the cartridge was adopted—1906. The .30-06 remained the U.S. Army’s primary rifle and machine gun cartridge for nearly 50 years before being replaced by the 7.62x51mm NATO (commercial .308 Winchester). The .30-06’s power and versatility have kept the round as one of the most popular for hunting big game. 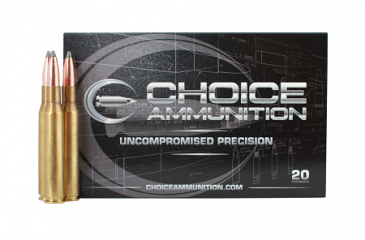 Choice Ammunition has taken our 100% hand-loading techniques and produce an extremely accurate, highly dependable round for the .30-06 in this load. Our loading tolerances are only matched by passionate hand-loaders in their own loading rooms. Consistent seating depths, powder charges and proprietary formulas of Choice Ammunition, make this 180 grain Barnes TTSX round the best you can buy on the commercial market today. .30-06 Springfield 180 grain Nosler AccuBond- The .30-06 Springfield was introduced to in 1906. The “.30” refers to the caliber of the bullet. The “06” refers to the year the cartridge was adopted—1906. The .30-06 remained the U.S. Army’s primary rifle and machine gun cartridge for nearly 50 years before being replaced by the 7.62x51mm NATO (commercial .308 Winchester). The .30-06’s power and versatility have kept the round as one of the most popular for hunting big game. Choice Ammunition has taken our 100% hand-loading techniques and produce an extremely accurate, highly dependable round for the .30-06 in this load. Our loading tolerances are only matched by passionate hand-loaders in their own loading rooms. Consistent seating depths, powder charges and proprietary formulas of Choice Ammunition, make this 180 grain Nosler AccuBond round the best you can buy on the commercial market today. .30-06 Springfield 180 Grain Nosler Partition~ The .30-06 Springfield was introduced to in 1906. The “.30” refers to the caliber of the bullet. The “06” refers to the year the cartridge was adopted—1906. The .30-06 remained the U.S. Army’s primary rifle and machine gun cartridge for nearly 50 years before being replaced by the 7.62×51mm NATO (commercial .308 Winchester). The .30-06’s power and versatility have kept the round as one of the most popular for hunting big game. 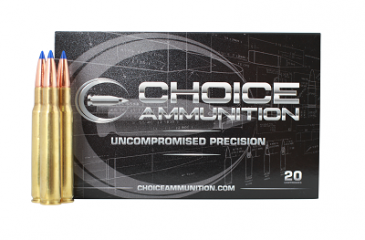 Choice Ammunition has taken our 100% hand-loading techniques and produce an extremely accurate, highly dependable round for the .30-06 in this load. Our loading tolerances are only matched by passionate hand-loaders in their own loading rooms. Consistent seating depths, powder charges and proprietary formulas of Choice Ammunition, make this 180 grain Nosler Partition round the best you can buy on the commercial market today. 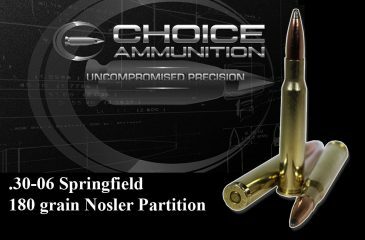 .30-06 Springfield 165 Grain Nosler Partition~ The .30-06 Springfield was introduced to in 1906. The “.30” refers to the caliber of the bullet. The “06” refers to the year the cartridge was adopted—1906. The .30-06 remained the U.S. Army’s primary rifle and machine gun cartridge for nearly 50 years before being replaced by the 7.62×51mm NATO (commercial .308 Winchester). The .30-06’s power and versatility have kept the round as one of the most popular for hunting big game. 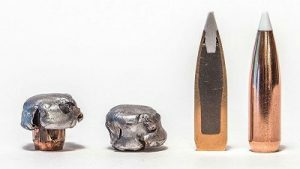 Choice Ammunition has taken our 100% hand-loading techniques and produce an extremely accurate, highly dependable round for the .30-06 in this load. Our loading tolerances are only matched by passionate hand-loaders in their own loading rooms. Consistent seating depths, powder charges and proprietary formulas of Choice Ammunition, make this 165 grain Nosler Partition round the best you can buy on the commercial market today.